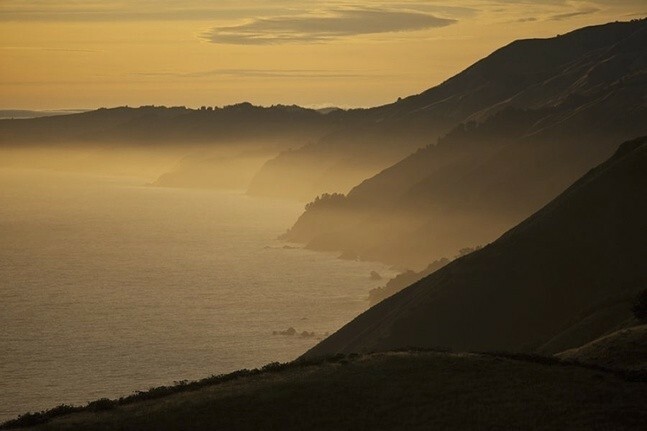 You are here: Home / Architecture / Big Sur……. After several cold but sunny days, Sunday started gray, with snow now coming down. My mood was already a bit bummed because on Saturday I received notice that “Garden Design” magazine would no longer be published and the issue I received Saturday would be the last. No warning at all, the new CEO felt that this magazine was a high level boutique magazine (180,000 subscribers) with not enough ad revenue for their liking, so ka-poot, ended it. This was an amazing magazine, kind of the Architectural Digest for Garden Design. It was not so much “how to”, but a showcase for amazing gardens and their designers, photographed impeccably, and endless inspiration. Everything now days has to a be huge moneymakers or out the door. What about the value of art, in this case gardens as art; simply art for arts sake? They are not going to even go digital. 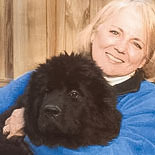 Like other incredible magazines of its kind – “Southern Accents”, “Home and Garden”, I am beginning to wonder if a magazine that you can hold, study, flip back and forth between pages, save and read and reread, will all eventually go by the wayside. Digital has its place, but there are certain books and magazines that deserve better. What was even sadder, was they offered to replace our remaining issues with Prevention, Parents, and a few totally unrelated, and no comparison magazines. Corporate America………don’t get me started. 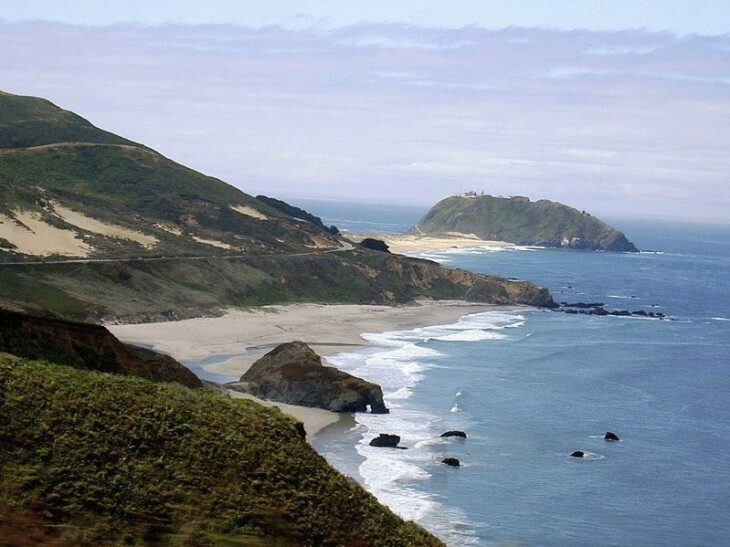 Soooo, between snow again, and no more of a great magazine, I was thinking about another of my favorite places……the California Coast, and in particular, Big Sur. 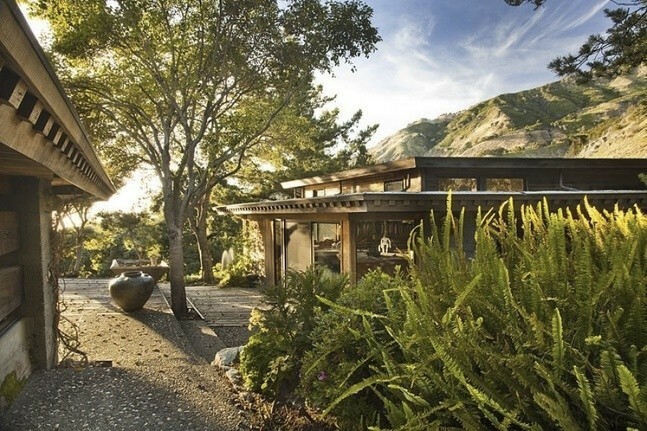 I came across this rare offering of a home in Big Sur. Sometimes the view is everything, but this also includes a home designed by an architect, Mark Mills, who worked quietly, and now is getting considerably more National recognition for his body of work. Mr. Mills graduated with an engineering degree, and had long admired Frank Lloyd Wright’s work. Enough so that he ended up working and studying with him for four years. 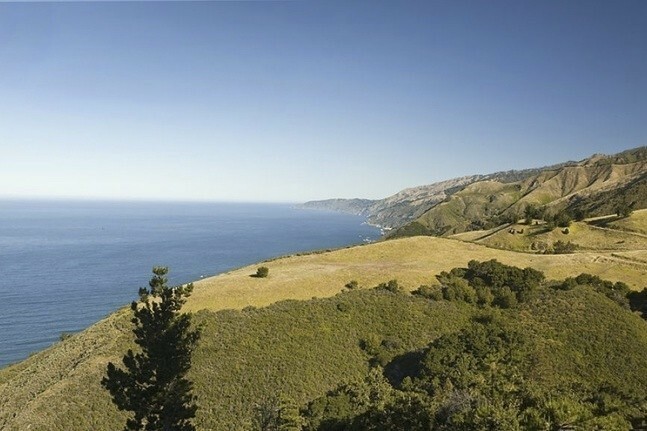 He then set out living and building in the Big Sur area, where he died in 2007. 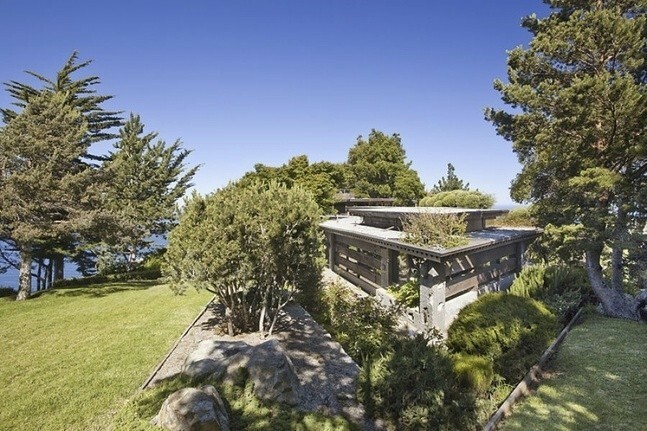 He built homes that were often hard to find, and because of his deep respect for nature, they melded into their setting. 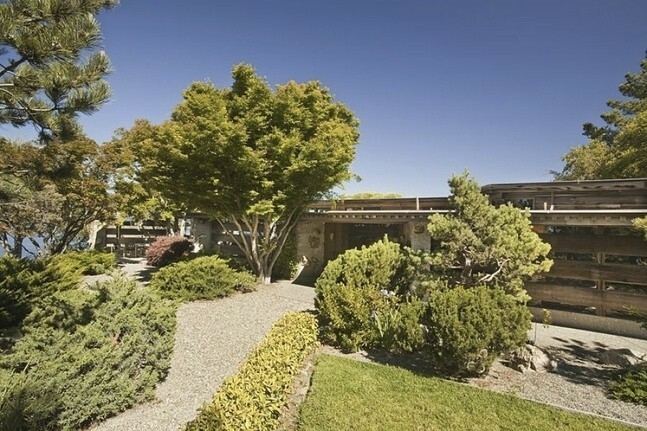 This home has 180 degree views of the Pacific as well as views of the surrounding Santa Lucia Mountains on the other sides. 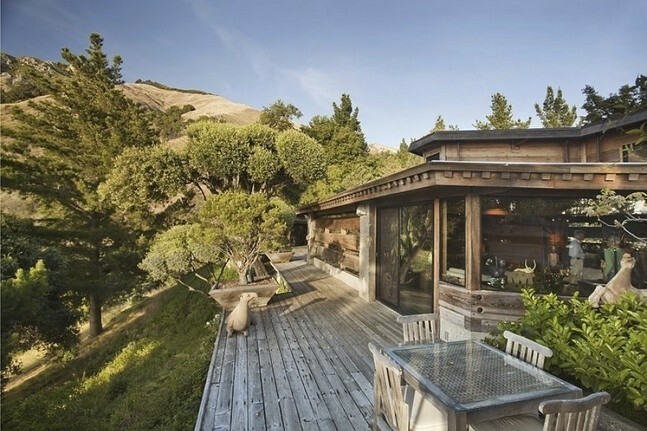 Homes in Big Sur fit the rustic surroundings. Even today there are fewer than 1,000 residents, most descendants of the original ranchers, artists and writers. Rugged indeed, they did without electricity until the 1950’s, as it was extremely remote because of difficult access. Here is a gorgeously designed and crafted home, true to it’s intent of being at one with it’s surroundings, as would any lucky person living here. Shall we begin the tour with one of the stunning views? This gives a real good sense as to how the house seems to sit as part of the land, not dominating it. 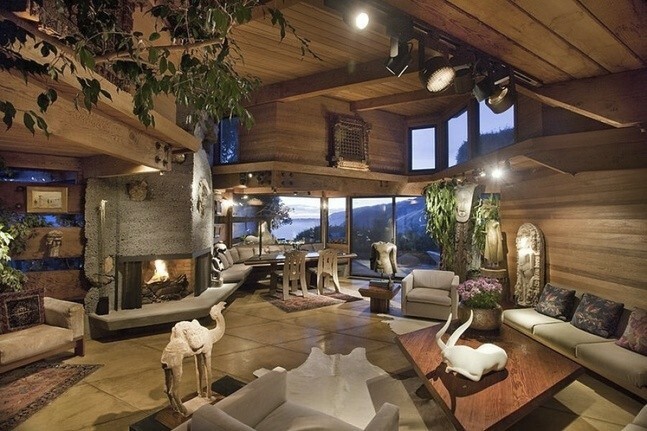 The main living area…. 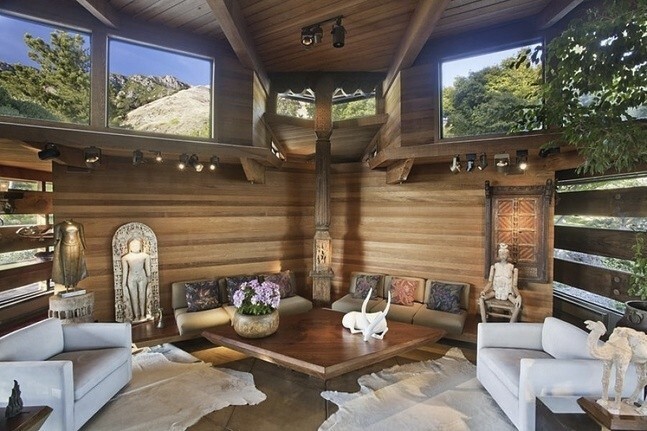 a rustic elegance that would be difficult to resist…….don’t miss the view straight out the windows. The wood, the changing ceiling heights both offer a warm ambiance, and combined with stone on the floor and fireplace is perfect for one or a group. A large room, but warm, inviting and cozy nonetheless. 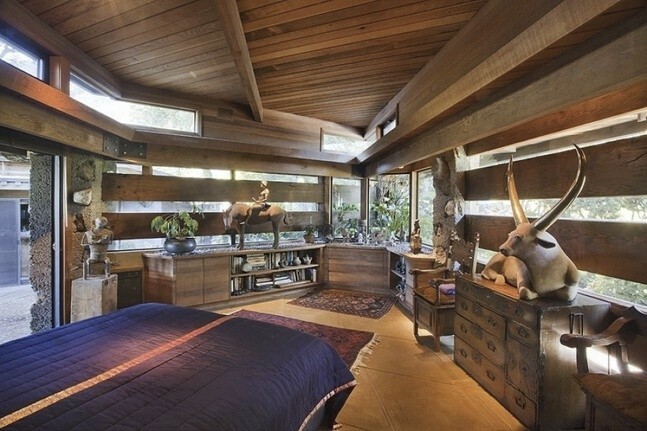 One of only 2 bedrooms, with the expected horizontal redwood with gaps of glass bringing the outdoors in beautifully. At night I bet it is amazing, especially from outside. Again, the views are everything. 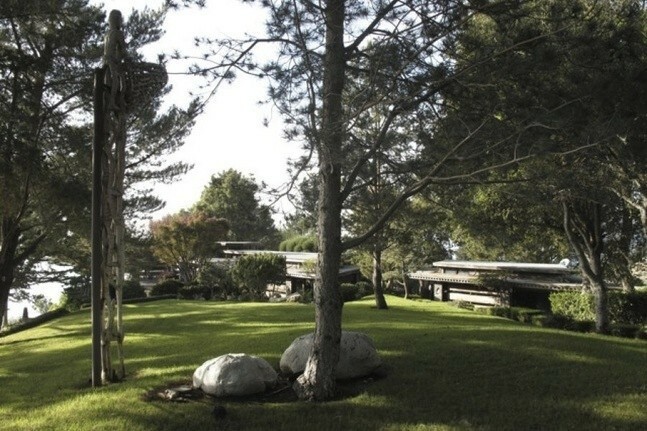 There is a detached guest-caretakers house & an artists studio on the property. 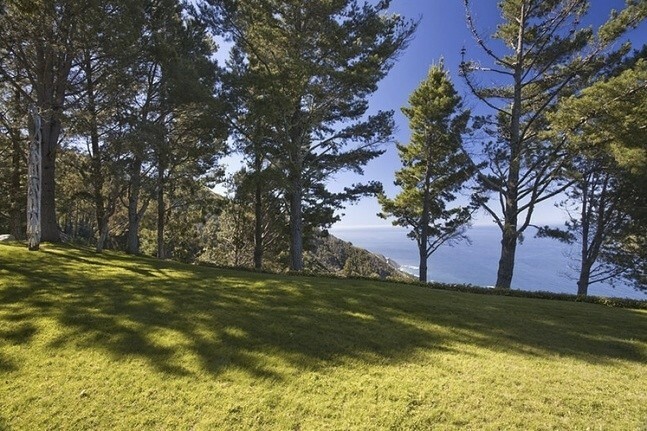 Landscaping that can take the shifts in the wind and salty air. 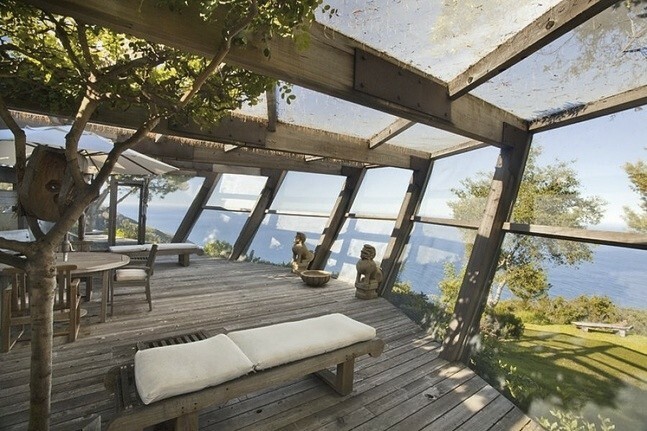 How beautifully the architect framed the views….it is as though the view is framed wall art. 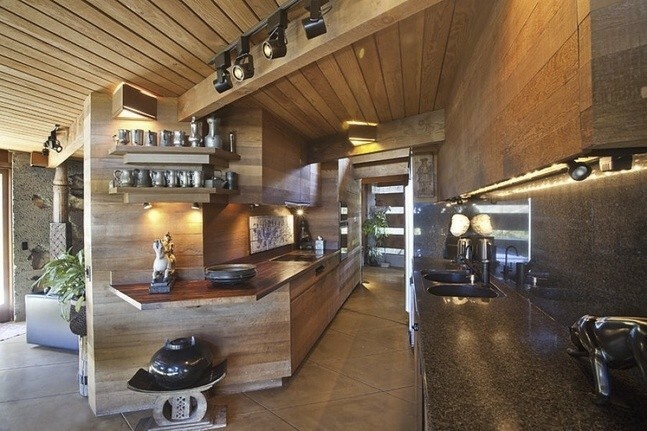 The kitchen is fully integrated into the rest of the house’s design, organic all the way. View of the Santa Lucia Mountains. Another view of the harmony between the house and the land. To sit on this land with that view would spark almost anyone’s sense of awe, and wonder. On a sunny warm day, I would be walking the beach, and watching for whales.